Give your visitors, guests or business associates a gift they will remember! 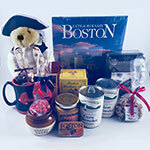 With products that sample the best of Massachusetts. This set contains a selection of foods, quality souvenirs, snacks, beverage and a book. Items that can be consumed on site or taken back home in the convenient travel pack with handle. Contents of the gift box include: Massachusetts: A Scenic Discovery photobook by photographer Steve Dunwell, Boston Attractions mug, bag of Wicked Cranberry Walnuts from Cape Cod, Ipswich Ale mustard, Cape Cod assorted chocolate-covered cranberries, crock of candy Boston Baked Beans, box of three Pure Maple Sugar Candies, can of New England clam chowder, can of New England corn chowder, bag of Venus Fancy Water crackers, Pillow of Boston Harbor tea, two bottles of New England Macintosh Sparking Apple Cider, and a Boston bear. Each Boston Executive Gift Box is attractively packaged in a white gift box with handle, which is delicately packed in a shipping carton. Specify a gift message at checkout and we will include a gift card at no charge. Optional gift wrapping is available.